El restaurante El Pasaje Sevilla, ubicado en el Pasaje Vila de la capital de Andalucía, llega hasta este lugar para revolucionar el mundo del tapeo andaluz. Tras un diseño clásico, la cocina de este restaurante sorprende con una fabulosa cocina de autor famosa por sus buenas presentaciones a base de diseño y creatividad. En el restaurante El Pasaje, el sentido de la vista se pone las botas. La Ensalada de queso, almendras y mermelada de frambuesa, la Delicia de foie con queso y manzana caramelizada y el Salmorejo con jamón se exponen como pequeñas obras culinarias para satisfacer a los paladares más sabios. En la misma línea, se presentan sugerencias mezcla de la cocina internacional y la mediterránea como el Burrito de secreto ibérico, el Tataki de Solomillo o la Hamburguesa rústica. Este híbrido entre los productos locales y los procesos de elaboración más exóticos se traduce en una experiencia de diez. Si vas de ruta de tapas por Sevilla, este es un lugar de parada obligatoria. ¡Las mejores te esperan allí! Friendly setting with unusual dishes that tasted great and were reasonably priced. Great food and friendly staff! We enjoyed everything that we ordered, my favorite was the mushroom risotto and baked goat cheese. Their menu suggests they are meat specialits and so they are. We got the most perfect peace of meat and got all vegetables (very tasty) instead of the carbs. OMG, what a treat, the best we had in Sevilla. As an additional dish we took the artichokes which were topped with a very light vinaigrette, olive oil and ground roasted almonds. The deserts were to die for and we left the place incredibly satisfied. In addition, their wine selection by the glass was very good. Lastly, staff were incredibly helpful explaining the dishes to us. Very well managed place! We will certainly be back! Excellent food. A little more sophisticated and up market than most others surrounding tapas bars rather than traditional. Best for an evening meal. Excellent service and amazing food. Best meal of our trip. Great restaurant. We booked for 8pm (the Spanish eat late) and sat in the back glass room area. We were a wee bit cold to begin with but once the restaurant filled up, we were warm. The waitress was very helpful in guiding us on what tapas to order and all of it was delicious. We ended up with 3 tapas, coffee, desert and 2 glasses of wine each for a total bill of €54 (for 2 people) which we thought was pretty reasonable. I did tell them when I booked that is was my husbands 60th birthday surprise and was hoping that they would give him a wee surprise cake/drink but that didn't happen. Never mind, it was still a nice evening out. We went in for lunch and it was very quiet. I’m sure it gets kicked up for dinner, as do most places in this neighborhood. The food was spectacular. I highly recommend making a visit to this restaurant. The staff was very friendly and helped us with our terrible Spanish. Thanks Dorothy for your opinion. 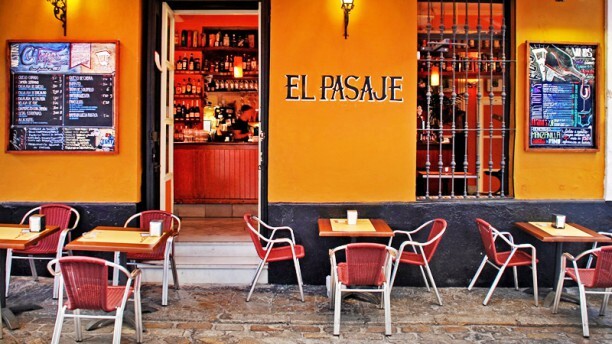 We hope to see you in another time in El Pasaje. We was a fam with two kids out eating lovely tapas! Service was superb! Food was good and the staff was kind! Great service, food choices and environment. Highly recommend. We had an excellent late - post flamenco - supper, consisting largely of tapas dishes which our waitress was extremely helpful in the choosing of. She was attentive and entertaining, the food delicious and final bill really fair. We only had a few things as we weren’t that hungry, but they were all beautiful: tuna tartar, slow cooked oxtail on focaccia and artichokes. The complimentary sweets sherry that was served as a digestive nicely rounded off our superb little meal. The waiter was very personable and explained the dishes in detail.